The main point of interest for Estillon during Domotex (booth F11- Hal 5) is the LVT concept: underlay for LVT and LVT click and various new installation tools. The underlay Timberbase is new in the assortment. Timberbase is a high density mineral based compound laminated with spunbond PP non-woven and an printed PE foil. Timberbase is suitable for the installation of both click LVT and parquet-/laminate flooring in domestic and project area’s. Soundbase (10dB ΔLin) is suitable for the installation of both click LVT and parquet-/laminate flooring in domestic and project area’s. Soundbase has good compressive Strength to maintain the integrity of the joints of the flooring elements and therefor suitable in combination with floor heating. SMARTfloor: Construction Floor to create a new smooth and isolating subfloor that is immediately accessible, thanks to its 50 mm wide self-adhesive overlap-joint. For the renovation of bad subfloors for installation of LVT. Reduces impact sound and offers a reduction of ΔLin 12dB ; ΔLw 23 dB. We will also pay attention to the Roberts tools. The LVT cutters, the laminate cutter and the new mini handsaw will be shown and demonstrated by Jason Roberts. Jason will frequently demonstrate the carpet stretching and the single stick method. Next to that, LVT and LVT click will be installed in combination with Timberbase, Soundbase and SMARTfloor. On our booth, a carrousel with various products, is new. 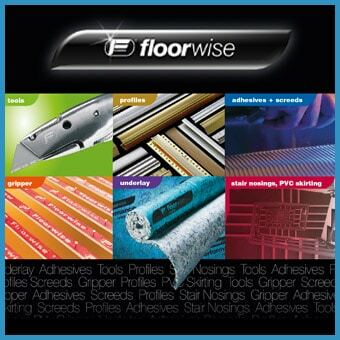 You will also find the new welding tools for seaming linoleum and LVT floorings and the new powermixers for levelling compounds and adhesives will be shown. You are welcome on our booth F11, Hall 5.